Gradually, they walk back from the fraud. Will it be an inquiry or a whitewash? A lot of people have a lot to lose if data manipulation is exposed. Let us see now…what is the ultimate known example of greenhouse gas warming via CO2? The planet Venus. williatw, that is an interesting back-of-the-envelope calculation...do you know if anyone has developed it further? I don't remember all the details about Venus, but some of the reasons why it may be so hot could involve some other factors aside from solar input. Certainly, the much thicker and denser atmosphere will insulate a lot more than a thinner one like ours. Also, the entire surface of Venus is geologically young. This hellhole has recently been resurfaced by violent eruptions and magma. So perhaps there is also a much higher internal source of heat compared to what we see at our own crust that is still cooling off very slowly. I guess i am the man in the middle, I do believe our climate is changing I just do not think man is the primary cause. Water vapor is a bigger contributor to the greenhouse gases thing in my opinion. What to do? Well in reality it would not take much at all to fix the problem. The airline industry has a solution readily available for us today. Just a few simple additive to the fuel and the problem is solved. Hey, maybe them chem trail conspiracy people have something after all! a nice white blanket that blocks the sun from reaching earth. Or how about painting every roof white. Sounds stupid at first but it would add up to a noticeable effect. Or everyone plant a garden. not hauling our produce from five or six location around the world to feed us would have a potential large effect. or good ol george. In July 2012, the Haida Salmon Restoration Corporation dispersed 100 short tons (91 t) of iron sulphate dust into the Pacific Ocean several hundred miles west of the islands of Haida Gwaii. The Old Massett Village Council financed this project as a salmon enhancement project with $2.5 million in village funds.The concept was that the formerly iron-deficient waters would produce more phytoplankton that would in turn serve as a "pasture" to feed salmon. Then- CEO Russ George hoped to sell carbon offsets to recover the costs. The project was plagued by charges of unscientific procedures and recklessness. George contended that 100 tons of iron is negligible compared to what naturally enters the ocean. In reality it seems that nobody really wants to fix the problem just b!cht about it. JoeP wrote: williatw, that is an interesting back-of-the-envelope calculation...do you know if anyone has developed it further? It is indeed a "back-of-the-envelope calculation"...one variable I seem to recall that I didn't take into consideration is I believe that heat transfer (by radiation) is proportional to the 4th power of the temperature difference. That may account perhaps for Venus's "relative coolness" even with its' 100X times Earth's atmosphere of heat trapping CO2 . The natural tendency to just radiate the heat back into space; after all Mercury at 36M from the sun receives (67 squared/ 36 squared = about 3.5X times Venus's solar constant) and is yet cooler than Venus. No atmosphere to speak of (in the case of Mercury) heat must much more readily radiate back out into space. I favor the adiabatic compression theory of planetary "greenhouse" effect, modified in the case of Earth by temperature dependence and other factors relating to cloud formation. 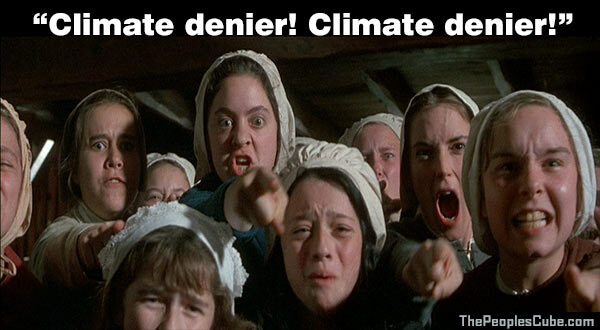 Climatists are is serious denial about these theories. With regards to Venus, it's worth noting the temperature profile of the atmosphere, including temperatures where pressure is near Earth sea level normals. I'm not finding the link off hand, but I've seen a paper where a simple model based entirely on solar intensity and surface pressure was able to fairly match the surface temperatures of Venus, Earth, Mars, and Titan. So my questions are how much total solar irradiance must increase to warm the planet one degree? If the atmosphere is warming it should be expanding, so what are the noticeable effects on the space station, satellite life and orbits? If the surface of the earth is warming should we not see a measurable effect in earth quakes and volcanic activity due to the crust expansion? The only one they see to talk about is rising ocean levels and as I live on the coast I see plenty of evidence the shore line has varied many miles long before man(?) made temperature rise. Has anyone seen any documentation on this? It is not only the amount of sunlight, the absorption and emission of heat, but also the reflectivity of the atmosphere - mostly in the form of clouds. The cloud tops of Venus reflect a lot of sunlight, so simple atmospheric greenhouse gas comparisons are only a partial solution. On Earth clouds might reflect back to space or retain more heat, depending on the type and altitude of the clouds.There is uncertainty here and this decreases the confidence in the global warming projections. I don't know the validity of the data, but even if acurate, the projections are iffy. I also agree that failure to have incorporation of solar output into the equation tells only part of the story. Actually, the Earths atmosphere has contracted in recent years. This is due to lower Sunspot numbers with associated decreased short wavelength solar radiance. This is evidenced by decreased LEO satellite orbit decay. Again, just what this means for the energy input/ output balance is uncertain. The field of global warming is a work in progress. And, what annoys me, is the grandiose statements that are made, like the North polar ice cap will be gone in two years. A bold statement made multiple times over the last decade. When these bold claims are made, then dis proven with time, the credibility of the "experts" is damaged. Honest admission of uncertainty in responses to setbacks in their predictions are avoided. Excuses are given instead. I suspect some of the honest researchers cringe when they hear these pundits on their soap boxes. I believe there is probably some global warming occurring as there has to be some warming or cooling on short term and long time scales. A perfect balance is impossible and is born out by Earth's history. The magnitude of the changes are the real issue, and this is where the confidence is low. Not included variables in a nice neat model is also a problem for prognosticators. Vulcanism, methane clatherites (sp?) stability, ocean current changes, Solar output, uncertainty in cloud effects, and no doubt numerous other elements plays a role in the final product. It is sort of like plasma physics. It is hard to predict with high confidence. Only experiment/ time will give an accurate and precise answer. The Tokamak band wagon is perhaps a comparable example. Uncertain predictions and projections are used to justify a narrow viewpoint, and course of action. Nice post, Dan. The trouble has been with the historical temperature proxies, and one proxy in particular, where one tree ring proxy bodge dominated the IPCC AGW scare story reports. And like the Hollywood demon 'Chuckie' that never really dies, even after complete overturning of the 'one tree to rule them all' proxy based hockey stick, the stick keeps finding its way out of the grave. Now another proxy paper based on stalagmite growth has reaffirmed the reality of the Medieval Warm Period as well as other warm periods. Such warm climate variations counter the narrative that CO2 is the dominant climate driver and that CO2 is only explanation for the modern warm period narrative. propaganda and real science don't mix well. If this case ever gets before a judge it should drive a stake through it.